Specifically designed to fit your original equipment, our airintake filters offer equal to or better than performance based oneach manufacturer's stringent specifications. 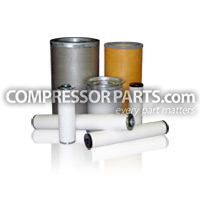 Since our suppliersspecialize in filtration, they are able to take OEM requirementsand combine that knowledge with their filtration experience tobuild a superior filter. An Compressorparts air intake filter holds its shape underpressure and will maintain the maximum surface area for improvedperformance. Its rigid construction helps maintain even pressuredifferentials keeping filter from collapsing and shutting down yourcompressor. Because of how it's constructed, you won't find one of our airintake filter failing prematurely. Built with such features assteel metalwork, nylon end-caps and metal to metal welding, withour air intake filter your compressor can perform better and lastlonger.